Karen Phelan’s premise is that consultants and consultant companies use strategies and tools that have worked in the past. Her caution is that not every strategy is transferable, at least in total. There is a Yiddish Proverb that I like, “Beware of the prophet who carries only one book.” This book identifies several lessons, both positive and restrictive, Phelan has learned in years of consulting. The book helps us realize that the models and frameworks we use should be used in conjunction with the human skill of leadership. This is a book about a business consultant who wants to help leaders and organizations. As an MIT graduate, academic achievement was not an issue for her or the people she is writing about. Phelan stressed that very smart consultants learn and use models to fix problems. Where they get it wrong is in finding a solution that works in one or two places and assumes it is a best practice. The consultant writes a book and trains other consultants in the use of their new model. Unfortunately, the consultants wind up trying to fit business problems into the models they know and promote rather than adapting the model or creating solutions to the specific business challenges. “Real-world results do not [necessarily] match the theories.” There are commonalities for sure AND always differences in organizations. 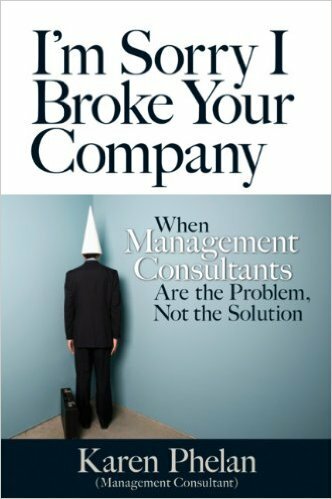 There are examples in this book about consultants, who solve problems in a few companies and make the assumption those practices will solve every similar problem in other companies. Another example is the “rank and yank” method. Jack Welch, GE, and other companies used the method of ranking each employee. Each year GE would dismiss the bottom 10% of their employees and hire new employees. GE, as well as other companies, abandoned this method because productivity declined. Several technology firms found out that some of the most creative individuals were not being ranked high but had creative and functional knowledge and skills the company needed. At times, in the rush to solve problems, senior leadership develops detailed plans and procedures. “Optimized processes only look good on paper,” said Phelan. “Having people to rely on for improvements is all you really need. I found that most of them knew exactly what the problems were and wanted to help, but not only were they powerless to change the way things worked, they were alienated.” This again is a reason SCC is designed to facilitate a person to develop plans focused on the real issues, who can take the actions necessary to work with those who are closest to the problem. People manage not the measures! Sometimes they even manipulate the measures! A metrics scorecard acts like a car’s dashboard. If you watch it instead of the road, you will crash! A couple of quotes from this book that caught my attention are: “Every business problem is about people reacting to circumstances…In a human-created world, most of the problems are created by humans.” As I read these quotes I remember that all of Marshall Goldsmith’s best-selling books offer practical help with how people deal with their environment and improve. In order to increase effectiveness, leaders need to listen to the constituents, take them seriously, and show a genuine interest in their point of view. This includes letting people vent their frustrations. If people do not feel heard, it will be difficult for them to move toward solutions. From my experience, even though people have deep knowledge and may know the answer, it is the process of listening, building relationships, and taking positive steps that offer long-term sustainable solutions with commitment. People will support what they help create. It is the people who make the workplace better, not the plan or tool. As Eisenhower said years ago, “In preparing for battle I have always found that plans are useless, but planning is indispensable.” It is not the battle plan itself that is important, yet the planning is of value. In many ways, real leadership is having a plan and being flexible, adaptable and creative while moving toward the desired results. Acronyms help ideas stick. The title of chapter four in this book is: Standardized Human Asset Management is a SHAM. Titles for employees can be a positive motivator or an emotional deflator. “Anyone who has experienced standardizing titles and job levels knows that this is a highly emotionally charged and political process.” Standardizing appraisal systems can also cause problems. On one hand, it is important to have common standards for legal and organizational reasons. However, not everyone needs the same thing to increase effectiveness. One of my favorite quotes in this book is, “I’ve been married for over twenty years with no annual performance appraisal.” Bill’s thought – I am not going there. HA. Eighty percent of people believe they are already in the top twenty-five percent of the employees. You may be good AND you can get better. New hires come in with different skill sets, as leaders continue to grow they acquire different skills, and changes in the marketplace require new ways of thinking. “Performance is not improved through the appraisal process—rather, just the opposite occurs. The appraisal process deflates people. When thinking about leadership, I have found it is either deficit or developmental. A deficit is trying to find out what is wrong. Developmental is finding what is not working and looking for ways to get better. Remember that Einstein was not the best performer at several jobs. The book about Enron was called The Smartest Guys in the Room. I heard an HR director said recently: “we can’t fire our way to excellence.” He left the company last year since the top person stayed with the ‘results or get fired’ policy. Of course, lots of other talent left over the five years. This ‘Rank and Yank’ strategy of many corporate companies is being increasingly abandoned by many of its practitioners. Performance improves by the coaching and feedback that occur in the daily interactions of people. As Goldsmith has stated, Stakeholder Centered Coaching takes good people and helps them become better. Since the world and business is constantly changing Goldsmith’s first book is a perfect fit. What Got You Here Won’t Get You There. “Peter Drucker believed that it was critical for people to develop their own goals. People are much more motivated to work on objectives they created themselves than objectives that were handed down to them.” Well, what about if the objectives were handed up. Those who are in the best position, direct reports, provide suggestions and feedback. This is authentic feedback that can make a difference quickly given the desire to improve. Show you care. When my employees succeed, I succeed. I get to know people because I want to get to know people, not as a “technique. No one knows what is in your head. Be Flexible/Adaptable/Responsive. If something is not working, try something different. Think and Plan Ahead. Map out what needs to be accomplished, by when, and share the information with your team. Referring to Warren Bennis’ research on leadership, quoted in Chapter 7 of this book: “No leader sets out to be a leader per se, but rather to express himself freely and fully.” That is, leaders have no interest in proving themselves, but an abiding interest in expressing themselves. The difference is crucial, for it’s the difference between being driven, as too many people are today. And leading as too few people are doing today.” When it comes from benefiting from conversations that freely flow up and down the organizational chart, John Gardner has a great quote: “Pity the poor leader who has unfriendly critics and uncritical friends.” Leaders without people they trust willing to provide unfiltered truths can be devastating for building credibility. Again Karen Phelan has a quote that sums this up. “Instead of trying to take the humanity out of the workplace, we need to strive to develop as much humanity as possible. The difference is understanding that the solutions, methods, and theories are not the truth but someone’s perception of how the world works. We can learn from other people’s perceptions to broaden our own insight, but we need to recognize there is a good chance that some of their ideas are wrong.” We need everyone’s talent, fully developed to create the best companies. Gardner, J. (1990). On leadership. New York: The Free Press, Inc.
Hersey, Paul. (1984). Situational Leadership.